Cass academics Dr Simon Hayley and Professor Emeritus Alec Chrystal have written an innovative new guide to economics, published by Oxford University Press. The book is designed to equip readers with an understanding of all the basic principles of economics. The book - Economics: A Primer - is written specifically for readers with no prior knowledge of the field. Technical content is kept to a minimum and the universal principles of economics are distilled. This approach ensures that the connection between economic theory and our everyday lives is illuminated. Dr Hayley said the book evolved out of necessity, growing out of a popular series of lectures that he and Professor Chrystal delivered during Cass induction week. The academics converted the lectures, plus additional material and insights from their careers in the public and private sectors, into a book, bringing the content to as wide an audience as possible. Dr Hayley said economics courses can sometimes be quite unnecessarily mathematical, requiring students to grind through algebra or complex charts. Whether you are taking a short course in economics; are about to begin an Economics or related degree, or simply want to understand the theories which lie behind the headlines, Dr Hayley said this book will allow you to master the core concepts. 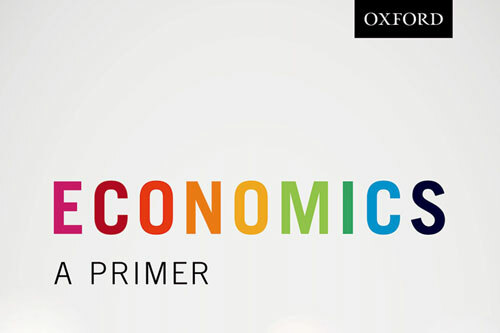 Economics: A Primer is accompanied by a suite of additional materials from the Online Resource Centre at Oxford University Press. Dr Simon Hayley is Senior Lecturer in Finance at Cass Business School, City University, London, and Professor Emeritus Alec Chrystal is Professor Emeritus of Economics, Cass Business School, City University, London.